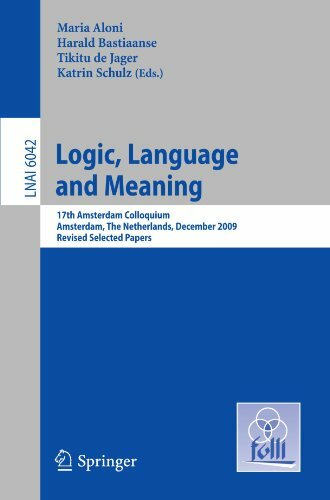 This book contains the revised papers presented at the Amsterdam Colloquium 2009, held in Amsterdam, The Netherlands, in December 2009. The 41 thoroughly refereed and revised contributions presented together with the revised abstracts of 5 invited talks are organized in five sections: the first section contains extended abstracts of the talks given by the invited speakers; the second, third and fourth sections contain invited and submitted contributions to the three thematic workshops hosted by the colloquium: the Workshop on Implicature and Grammar, the Workshop on Natural Logic, and the Workshop on Vagueness; the final section consists of submissions to the general program. The topics covered range from descriptive (syntactic and semantic analyses of all kinds of expressions) to theoretical (logical and computational properties of semantic theories, philosophical foundations, evolution and learning of language).